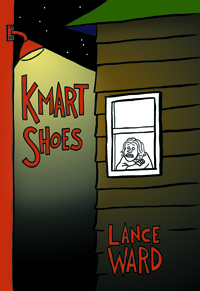 Lance Ward’s autobiographical graphic novel Kmart Shoes focuses on the author’s early years, a time of intense personal upheaval marked by divorce, the arrival of his mother’s abusive boyfriend, and a seemingly endless parade of bad breaks that could have potentially left him both emotionally and physically crippled. Fooling around with power tools and climbing to the top of a grain silo lead to broken bones, while experimenting with cocaine leads to addiction and, eventually, a botched attempt at robbery. Through it all, Ward struggles to make sense of the world, a struggle rendered all the more difficult by the fact that most of his family is emotionally distant or has abandoned him completely. Yet for all of the bad breaks Ward suffers, the tone of this graphic novel remains upbeat, for Ward-as-narrator (as opposed to Ward-as-character) has lived through all of the difficulties of his youth and arrived in middle-age relatively unscathed. In this respect, Kmart Shoes shoes is a story of survival akin to Von Allan’s The Road to God Knows, but it is also a story of rage turned sideways to produce humor. Throughout, Ward comes off as an affable storyteller who’s risen above life’s bad breaks to offer hope to those still living through them. A memorable debut. 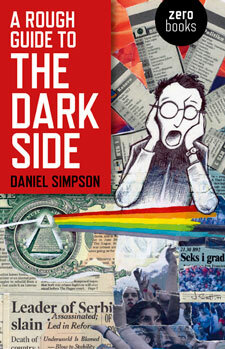 Towards the end of Daniel Simpson’s A Rough Guide to the Dark Side, the author writes of his earliest attempts to come to grips with the manic, maddening events described over the course of the preceding 200-some odd pages: “Writing proved much harder than expected. Like where do you start? When to stop? What to cut? How much of it could put you six feet under? My character drove me on towards the edge. If I didn’t rewrite it soon, I’d push me over.” What follows is a descent into madness and paranoia that only underscores Simpson’s prowess as a writer. As crazy and disjointed as the last chapter of this memoir may seem, those leading up to its tormented, spiraling conclusion offer a crystal clear, if nightmarish, account of the author’s misguided effort to stage a music festival in Serbia. In a voice reminiscent of Hunter S. Thompson, Simpson critiques everything from contemporary journalism to international politics as he recounts his woeful tale. A reporter for The New York Times when his narrative begins, the author is not content to participate in the echo-chamber of political reportage, so he decides, alone with a mysterious partner (referred to only as “G”) to stage a music festival on an island in the Danube. His efforts, however, are plagued by difficulties from the outset. With no money, Simpson can’t attract big-name performers, and without big-name performers, he can’t attract the advertisers and investors who might foot the bill for his festival. Along these lines, a visit to Elie Wiesel for the sole purpose of begging for cash is among the more bizarre — and entertaining — incidents in a book that’s riddled with bizarre, entertaining, and horrifying moments. In many ways, A Rough Guide to the Dark Side is also a delayed coming-of-age book. Throughout the proceedings, Simpson openly discusses his fears of squandering the potential of his youth, as well as his increasingly desperate attempts to numb his existential angst with a variety of drugs. Indeed, it’s this layer of the narrative that lends depth to the book and turns what might otherwise simply be the tale of a major entertainment industry debacle into an odd kind of bildungsroman: (relatively) innocent and naive boy goes to the war-torn Balkans and emerges a few steps closer to being a man. Reminiscent of Hunter S. Thompson’s The Rum Diary in terms of style and Peter Hook’s The Hacienda: How Not to Run a Club in terms of subject matter, A Rough Guide to the Dark Side stands on its own as a compelling critique of the media, international politics, and, ultimately, the author himself. An insightful and thoroughly enjoyable read. I’ve known of Ken Kalfus for a long time. A fellow Philadelphian (or is that phellow Philadelphian? ), he shows up at a lot of the readings I attend at the Free Library of Philadelphia, and he’s friendly with a couple of writers I know. Kathye Fetsko Petrie introduced me to him at a Jonathan Safran Foer reading, and Josh Emmons once invited me to join them for tennis. The reason I declined — aside from lacking any tennis skills whatsoever — also accounts for why my one and only meeting with Kalfus was so awkward: I’d never read any of his books. Until now. I was browsing the shelves at Farley’s Bookshop in New Hope, Pennsylvania, when I spotted Three Stories, a tiny book from Madras Press. I couldn’t resist making the purchase largely because reading the book would give me something to say to the author the next time I ran into him, but also because proceeds from book sales go to support the Free Library of Philadelphia, which is where I’ll probably run into the guy. How could I not buy it? The book, it turns out, is spectacular and makes me realize that I’ve been missing out on some great writing by not looking into the fiction of Kalfus sooner. The first story of the collection, “The Moment They Were Waiting For,” offers a meditation on free will. In it, the denizens of a city are cursed with the knowledge of the exact dates on which they will die — and regardless of the measures they take, their fate is inescapable. 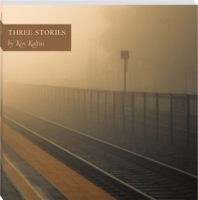 In the second tale, “Professor Arecibo,” an academic with a bad reputation overhears a telephone conversation about himself and struggles to deal with the resulting emotional fallout. In the third, “The Un-,” a young writer named Josh Glory yearns for publication and the recognition he imagines will come with it. 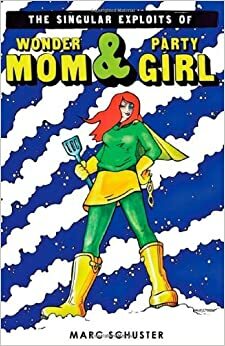 For my money, this last story alone is worth the $7.00 I paid for the 68-page collection. As a writer myself, I fully identified with all of the anxieties that make Josh Glory tick. “You could go crazy as you ascended the ladder of literary disappointment,” Kalfus writes. “You could be disappointed that you hadn’t written anything. You could be disappointed that what you’d written hadn’t been published. You could be disappointed that you’d been published but hadn’t sold many books.” The list goes on and on, and every writer in every stage of his or her career will identify with at least some element of the story. In fact, I’d go so far as to say that “The Un-” should be required reading for anyone considering a “career” in creative writing. The collection as a whole has an engaging, subtly Kafkaesque tone that amuses even as it offers a dark vision of humanity. 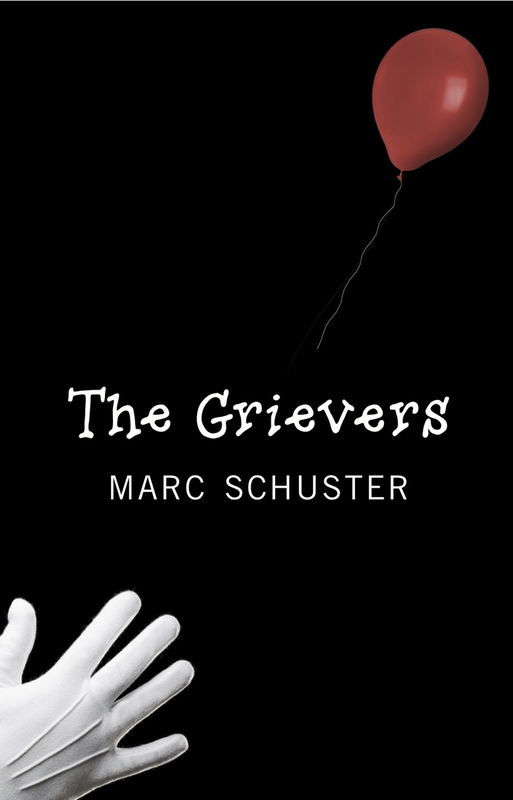 We are all struggling with a multitude of things that can drive us crazy, each story in the collection seems to say, and the only way to deal with the maddening crush is to keep on living one day at a time. Needless to say, I highly recommend this book, and I’ll be seeking out other books by Ken Kalfus in the very near future. With any luck, I won’t get tongue-tied the next time I run into him.